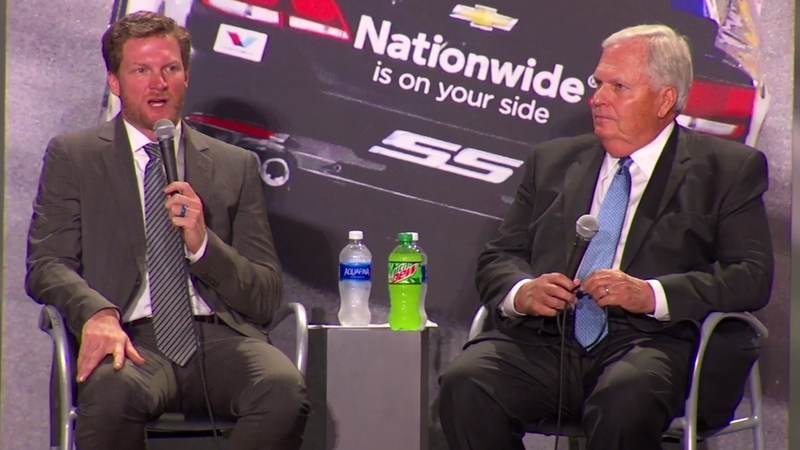 Earnhardt and Hendrick during today’s announcement. Screencap via Hendrick Motorsports. Dale Earnhardt Jr. is no stranger to getting hurt in the race car, but last year’s long concussion recovery opened his eyes to just how tenuous his health is as a racer. So, he announced today that he was retiring from the NASCAR Cup Series on his own terms while he still can make that announcement on his own. In words that somewhat mirrored those of NASCAR Cup Series racer Carl Edwards’ retirement earlier this year, Earnhardt said that he wanted to announce his while he’s still healthy enough to race well, as opposed to having an injury or some other reason make his decision to retire for him. Earnhardt’s No. 88 Hendrick Motorsports team made it through the end of the season with substitute drivers, but he still felt responsible for not being there for the team and adding extra work to their plates when he was out. “It was hard to watch all that happen knowing that I had an effect on that,” Earnhardt said. Telling team owner Rick Hendrick was the hardest part of his decision, Earnhardt notes. Hendrick was a massive source of support who stood by Earnhardt through his long concussion recovery when many team owners wouldn’t have. But Earnhardt knew he wanted to go out while he was still at the top of his game. “When I realized how delicate things are and how quickly things can be made for you...I started thinking about [retirement],” Earnhardt said in a Hendrick Motorsports press conference today. It’s a decision that Earnhardt describes as “very bittersweet,” as he still loves racing. When he was out of the car last year, all he could think about was how much he wanted to get back in the car. Sons of NASCAR legends who go into racing rarely have superstar careers of their own, so Earnhardt said that he set no expectations for his own racing career. He just knew he wanted to make his living racing cars. So, going on to an 18-year NASCAR Cup Series career with two Daytona 500 wins is more than he ever expected by a long shot, and he’s satisfied with ending that career now. Earnhardt is still going to be around the sport, mentoring younger racers, and continuing to be involved with his JR Motorsports team. He is even set to drive in two Xfinity Series races in 2018, because of course he is, and expects to step in and drive for the JR Motorsports team when it makes sense. Earnhardt doesn’t have any other racing plans at the moment, but is keeping it open. You can’t keep a guy like Dale out of a car for very long. And of course, he’s still going to finish out the 2017 Cup Series season. His goal is to get some wins in, which is still in reach. Earnhardt’s highest finish so far this year has been fifth place, so that’s not an unreasonable goal.